Question: I've been using Legacy for quite a while, is it worth it to purchase the Legacy training video set? A $39.80 value. Buy all five titles and save! Recommended for beginners to advanced. 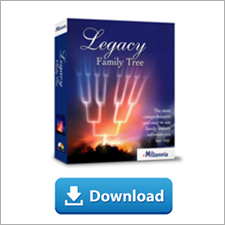 Visit http://www.legacyfamilytree.com/videos.asp to preview sample video training clips! 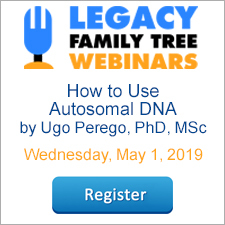 Most of us run into the situation where we locate a person who we think might be related to the family, but we're not certain. Griffin BROWN, born 13 Apr 1818 in Pennsylvania. He lived in Venango and Warren Counties. Even though I haven't proved whether Griffin BROWN is Asa's child, I still need to document and analyze Griffin's immediate and extended families, his neighbors, and associates. All of his family's information can be added to the same Legacy family file, but unlinked from the "known" family. Click on the Add menu. Add his information and Save. The new person is now "alone" or "unlinked" in your family file. He is not linked to the main family. He is in a separate tree. Once he has been entered, you can add his wife, children, and any other known relationships. The more you research his family, the more information you have to be able to determine if he fits into the "known" family. Merge "__________ BROWN" with Griffin BROWN by clicking on the Merge icon, and selecting Manual Merge. Select the two individuals, and merge them together. Link Griffin BROWN to his parents (Asa and Elizabeth) by first navigating to Griffin BROWN in the Family View. With Griffin highlighted, right-click in the empty parents area, and click Link to Parents. Because Asa and Elizabeth are already in the family file, now just select Asa in the list, and now Griffin appears as Asa's 3rd child. Before I linked Griffin BROWN to his parents, he was "floating" in the family file. In other words, he was unlinked from the main tree. In fact, in my personal family file, I have 33 separate, unlinked trees. Each tree is a person or a group of related persons that I have not yet linked to my main tree. As research progresses, I can either link these trees to my main tree, or I might find that they don't belong. This is a list of the current trees in my family file. Sometimes the tree finder might help you find persons that you thought were actually linked to your main tree, but somehow became unlinked. Most genealogists researching American ancestors love the detailed censuses taken between 1850 and 1930. Yet our eyes glaze over and our head starts hurting when we take on the columns and head counts of the pre-1850 census enumerations. Many researchers go so far as to avoid them altogether, or use them only as a source for the head of household. When used together, however, these early U.S. census records can often provide important clues to early American families. The following article is from Eastman's Online Genealogy Newsletter and is copyright 2006 by Richard W. Eastman. It is re-published here with the permission of the author. Information about the newsletter is available at http://www.eogn.com. OK, so you have scanned lots of old family photographs and now want to digitally restore them? You want to fix the creases and extraneous marks on the photographs to make them look better? What software will you use? Photoshop has the best reputation and is the choice of photo professionals everywhere. However, its "street price" of about $600 will discourage most amateur photo restorers. A stripped-down version of the program, called Photoshop Elements sells for about $90, a lot more reasonable price but still expensive for most of us. The GIMP (Graphics IMage Processor) is a powerful open source program that is available free of charge. However, its user interface is awkward to use. So what should you do? I'd suggest that you take a look at the FREE PhotoPlus 6 being given away by Serif Software. PhotoPlus 6 is an excellent program for photo restoration and other purposes on a Windows computer. To be sure, PhotoPlus 6 is not quite as powerful as the $90 Photoshop Elements. Then again, with a price tag of zero, many of us will accept a program that only has 90% of the capabilities of the more expensive program. I decided to try it out to see if it could entice me to abandon The GIMP, the photo editing program I normally use. PhotoPlus 6 is available as a 19.4 megabyte download. That will not be a problem for broadband users but anyone on a 56K dial-up connection will find that the download will take several hours. Even so, I'd suggest that this program is worth the wait. I downloaded the program and installed it. The first time I ran PhotoPlus 6, it connected to the Internet and then asked me to supply information for registering the program. I typed in my name and e-mail address. A few seconds later a series of letters and numbers was delivered to my e-mail address. This is the "unlock code" for the program. Once unlocked, the program asked for a bit more information, then launched the full version of PhotoPlus 6. The program's producers assure users that the registration will be free forever. The company does sell more powerful versions of the same program, however. PhotoPlus 6 includes capabilities to create, manipulate, and enhance photographs, bitmap graphics, and web animations. All the tools you need include handy hints to enable you to achieve the results you seek. The program also includes various tutorials for image and photo editing and special effects in the downloadable companion document. The tutorial includes hands-on examples, essential theory and useful tips. The program also includes FAQs: frequently asked questions and you may find the solution. I found the program to be very easy to use, much easier than the free photo editing program that I have been using. All in all, PhotoPlus 6 is an excellent program for a free offering. It is easy to use and includes all the basics. To be sure, it is not as powerful as the $90 or more programs. Then again, it doesn't cost $90 or more. I can strongly recommend PhotoPlus 6 for anyone who needs to occasionally edit photographs or bitmap images. Serious photography and scanning buffs will probably want a more powerful (and more expensive) program. For me, PhotoPlus 6 meets more than all of my needs. You can download the free PhotoPlus 6 at http://freeserifsoftware.com. While at the site, you might want to look at the other free programs the company offers. I haven't looked at the others yet but, if they are as good as PhotoPlus 6, they could be very useful. My thanks to Betty Clay for telling me about this great free program. Google is celebrating the first anniversary of Google Earth by releasing a new version, Google Earth 4 (which is in beta but is now available to download for Windows, Mac OS X, and Linux. If you've got a computer with the chops (Google Earth uses a lot of resources and might not run well on older computers) you can have a lot of fun with this thing. 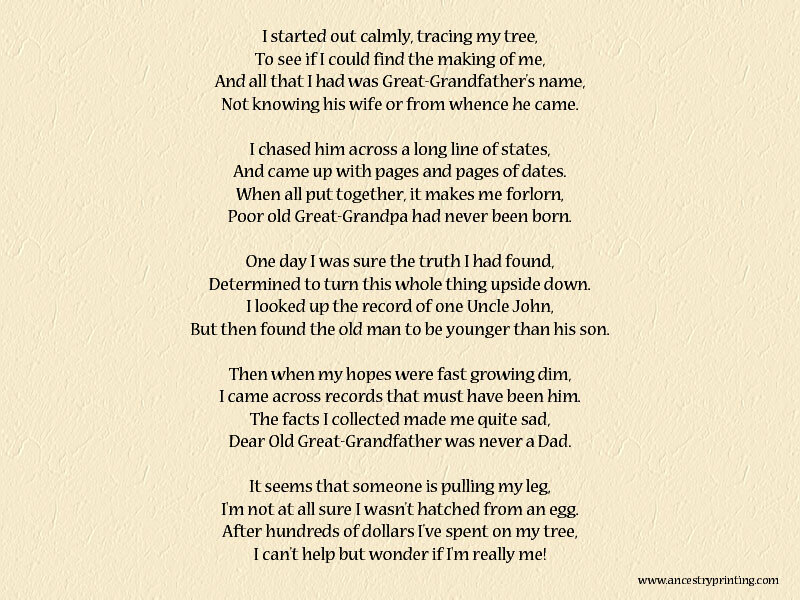 Genealogy Poem - Who Am I? Upgrade to Legacy 6 Deluxe Today! Most beginning genealogists start by researching and extending the genealogy of their own surname. Not me - I started by researching Browns, Williams, and Clarks. If you've got a surname like mine (Rasmussen) you might have Danish ancestry. I'm just starting my quest into the wonderful records of Denmark. Even if you have been researching for many years, any time you begin researching in a new area, you should become acquainted with its research methodology. In other words, learn about the history, geography, culture, records available, where the records are located, customs, etc. I've found several things to be helpful as I've started by Danish research. Research outlines are available for the U.S. states and most major countries around the world. The purpose of these outlines is to introduce you to the records you can use. They describe the content, use, and availability of major genealogical records. Use these outlines to set meaningful goals and to select the records that will help you achieve your goals. The languages section lists translations of the common genealogical terms that you would find in the major records. Christen Rasmussen was born in 1820 in Niløse, Holbæk, Denmark. Legacy's Research Guidance listed the records I should use to locate information about his life, and how to find his parents. It suggested that I search the census records, and had direct links to these records which were available online. It then suggested that I search the parish registers. This has been a gold mine - Legacy's Research Guidance linked me directly to the parish registers which were available online. Better yet, Legacy didn't just list a whole bunch of records in one long list - it actually ranked the records in the order of priority based on my goal. As a new Danish researcher, this has given me a great jump-start. Others will be digitized as time permits. They mention that all Danish parish registers older than 1892 are included in their digitization project. I learned that this doesn't necessarily mean that all the registers have been digitized, but that they do have plans to do this. Otherwise known as the Dansk Demografisk Database, this free website has been one of the most helpful resources. It has transcriptions and indexes of census, probate, and emigration records. Because the census records at the State Archives are not indexed, I used this database to first locate Christian Rasmussen and his family in the census. And because I'm still not an expert in reading Danish, its transcriptions of the records were especially helpful. I was then easily able to locate a digitized copy of the original census. We all know about the Internet's ultimate guide to genealogy - Cyndi's List. This is another great starting point for Danish research. The Denmark section currently lists 222 links to various Danish resources. Many of the links are of how-to articles, maps, mailing lists, and links to the major databases described above. If you really want to become immersed in Danish genealogy, Legacy is currently being translated into Danish. That's right - every report, blank charts, help file - the entire interface is in Danish. Now this hasn't helped my research too much, but it does include many of the important Danish genealogical terms. If you're good with the language, you can help test it. Ancestry.com has finally completed the every-name index of the 1910 U.S. federal census. Previously it was only a head-of-household index. With this addition, Ancestry.com is the only place online where you can search every name in the 14 publicly available US federal censuses. Begin searching by clicking here. Thousands of new web sites are created every day. Every once in a while, one of those websites is actually useful to the genealogist. On your lucky days, one of those web sites might contain new information about one of your ancestors. But unless you're "googling" every day, you might miss out on the new site. Google Alerts is a free service that can alert you to new web sites that match your search terms. For example, if you want to be alerted when a new web site is available about William HAGUE from Yorkshire, you can create a Google Alert that contains those search terms. Then, when Google finds a new site that contains those terms, you'll get an automated email. Learn more, or give it a try at http://www.google.com/alerts.